U.S. Postal Service officially issues a stamp featuring the "wascally wabbit" on the lot of Warner Bros. Studios in Burbank, Calif. The self-adhesive stamp depicts Bugs with his trademark carrot, leaning against a rural mailbox. In addition to being honored with a stamp, Bugs will serve as the "ambassador" for Stamperssm, the Postal Services program designed to reinvigorate the hobby of stamp collecting among the youth of America. "The rich history of the United States is portrayed through its stamp program. In that spirit, it is fitting that this uniquely American icon should be featured on a U.S. postage stamp," said Postmaster General Marvin Runyon. "Bugs Bunnys timeless and ageless humor has entertained audiences worldwide over the years, and now as the ambassador for the Stampers program hell help young people discover the entertaining hobby of stamp collecting." Dan Romanelli, President of Warner Bros. Worldwide Consumer Products said, "As this stamp carries cards and letters to their destinations worldwide and adds humor to stamp collections, we hope that generations will fondly remember the joy that Bugs Bunny has provided kids of all ages." The stamp will be officially dedicated in a 10:00 a.m. (local time) ceremony on the lot of Warner Bros. studios, where Bugs came to life over 50 years ago. Hundreds of local school children and invited guests are expected to be on-hand when the stamp makes its debut. Following the ceremony, the children will get a behind-the-scenes interactive look into the creation of animation, stamp collecting, and the Postal Service. First day sales of the stamp and a pictorial cancellation will be available exclusively at the Tour Office on the Warner Bros. Studios lot and at the Burbank Post Office on May 22. The stamp will be available in post offices nationwide on May 23, and to add to the "hare" raising activities, special events continuing the first day ceremony theme will be held at post offices and select Warner Bros. Studio Stores across the country. Select Six Flags theme parks will also add to the thrill of the stamps issuance. As ambassador for the Stampers program, Bugs Bunny continues a long history of service to his country. During World War II, Bugs helped promote the War Bond effort, was awarded a service record by the United States Marine Corps, and was adopted as an official member of the Seabees. The Stampers program has been well received, generating more than one million responses in the first two months. 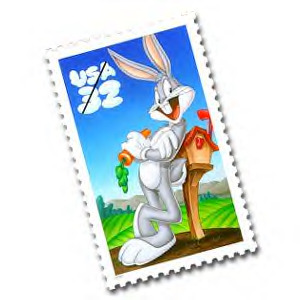 Stampers members receive free mailings which include, magazines, posters, and other educational items to help them start their own stamp collection.265 million of the Bugs Bunny stamps will be printed in a 10 stamp format which will feature a collectible card.